Now that the Pope’s humble Kia Soul has been garaged and the detritus left by the adoring crowd of Christian faithful in Abu Dhabi has been cleared up, what is the real legacy of his historic visit to the UAE, the first by a pontiff to the Arabian Peninsula? Two things come to mind on sober reflection. The first is that, in a region rocked by conflicts that are in large or small part predicated on religious differences, a substantial effort has been launched to remove intolerance of belief from the calculus of international and intra-national disputes. And next, the mistrust of Muslims by too many segments of society in the West may be more profitably addressed through an institution to be established in the Middle East itself. But of course, caution is necessary to prevent all that has been promised from dissolving into memories of feel-good bromides. Discussions at the Muslim Council of Elders meeting and the Global Conference of Human Fraternity have, it is hoped, established a “new normal” – not just in interfaith and sectarian relationships, but also in patterns of social justice and policymaking on the part of political and religious leaders. The significance of Pope Francis’s visit was not just apparent in the pageantry attached to it by his hosts, but also in the comings and goings at the Human Fraternity meeting, where Protestant pastors and Catholic priests, Muslim clerics, a senior rabbi and representatives of the Hindu, Sikh and Buddhist faiths joined together in attempts to untangle the doctrinal babel of triumphalism and misunderstanding that characterizes global religious practice. Events in Abu Dhabi have crystallized and highlighted informal movements toward consensus – religious and political – that have hitherto remained largely in the shadows. For instance, on the sidelines at the Human Fraternity conference, Rabbi Marc Schneier, president of the Foundation for Ethnic Understanding, predicted more robust relations between Jews and Muslims and spoke about growing familiarity between Gulf rulers and Israel in the face of Iranian expansionism. The UAE has been adept at hosting institutions and events relevant to the global and regional zeitgeist. The International Renewable Energy Agency, situated in Abu Dhabi, has become a focus for policy on renewables and the fight against climate change. The Abu Dhabi-based Muslim Council of Elders is a forum for establishing a moderate Islamic consensus. Now, the promised Abrahamic Family House museum in the UAE capital will arguably be the first institution in the modern age dedicated explicitly to recognizing commonalities between Judaism, Christianity and Islam. It is all the more significant that this theological bridge-building should take place in the Arabian Peninsula – a part of the world more usually blamed, rightly or wrongly, for religious intolerance – rather than the West – which claims the mantle of liberal forbearance toward all, but has in recent years fallen from its own standards. In the UAE today, moreover, it is now normal for local media to report on the presence of a synagogue in Dubai, something largely avoided for many years. Yet, it will be interesting to see how the same media covers ongoing Israeli participation in international sporting events, from judo to swimming. 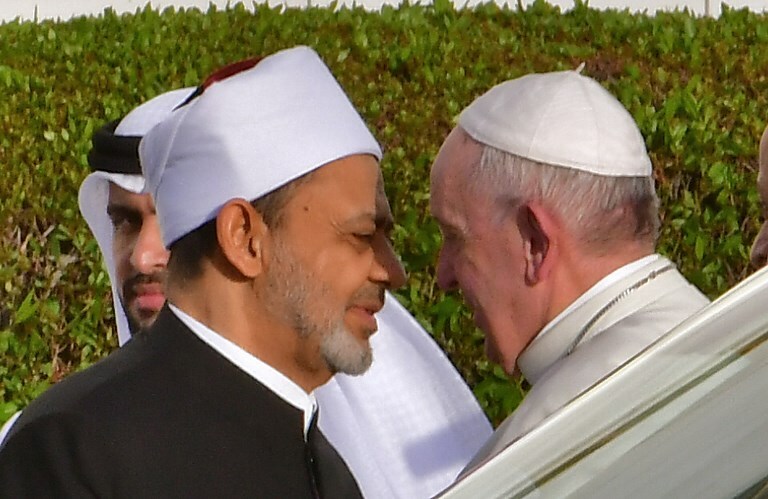 Commentators, especially in the West, will be tempted to dismiss the document signed by Pope Francis and Dr Ahmed Al Tayeb, Grand Imam of Al Azhar, as another cuddly communique issued by well-meaning senior clerics. But these two signatories hold in their hands the pastoral care and belief systems of millions of moderate Christians and Muslims worldwide. Their communique is a statement not just about religious harmony and joint values, but by extension about politics, economics and social justice. It firmly places religious extremists outside the tent, but also demands that official policy reflect these aspirations. Regional governments can be badly served by tiers of civil servants and advisers, who often choose to err on the side of caution and cleave to positions that their respective leaderships may have abandoned. There is frequently a “cloud layer” of risk-averse officialdom hovering over matters of fresh policymaking that can obscure the actual will of the leadership. This is partly why the implications of the final statement by the Grand Imam and the pope require ongoing official nurture and support, rather than retrospective self-congratulation. The statement is not an in-house discussion between religious leaders but also a challenge to regional governments, which in some cases ceded the post Arab Spring political and social narratives to Islamist fundamentalists. In a similar way, the role of the papacy retains enough moral authority to influence politics and opinion in its sphere of influence. Western critics of the Catholic Church describe it as an outdated guardian of equally outdated moral precepts, without taking account of the many encyclicals and pronouncements on secular political and economic trends. The collapse of communism was achieved not just through the actions of major Western powers, but through the outspokenness of Pope John Paul II, whose homeland was under the yoke of the old Soviet order. Martin Newland is a former editor of the Daily Telegraph in London, The National in Abu Dhabi and deputy editor of the National Post in Canada. He holds a master’s degree in pastoral theology, and as a journalist has covered religion and met two popes.